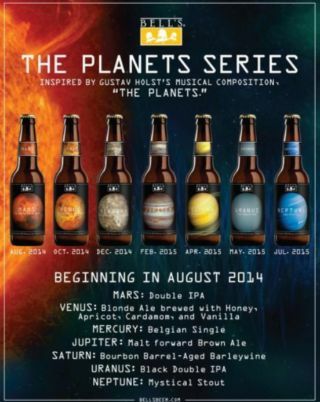 Bell's Brewery is introducing a series of seven beers based on the planets of the solar system (except Earth). The first release is expected in August 2014. In the universe of Bell's Brewery, Mars is a strong beer, Uranus a crafty potion mix and Mercury — that lightfooted messenger — a nimble brew. Such is the thinking behind "The Planets" series of beers that Michigan-based Bell's is pioneering this August, with a limited-edition set based on the famous orchestral suite by English composer Gustav Holst. Inspiration came from a lifelong love of Holst that began when Bell's founder Larry Bell was in high school, playing percussion for the "Mars" and "Jupiter" portions of the suite. At age 18, he purchased a record of the suite directed by composer Leopold Stokowski. "I think that vinyl is just about worn out," Bell told Space.com. The brewery's two most popular brands were inspired by literature that connects to his own life, Bell said. For example, "Oberon" is based on a character in Shakespeare's "A Midsummer Night's Dream" that Bell played in a sixth-grade version of the play. And "Two-Hearted Ale" is based on Ernest Hemingway's short story "Big Two-Hearted River." Bell owns property on the Big Two-Hearted River, which runs through Michigan's Upper Peninsula. So it makes sense that Bell would base some new beers on "The Planets," which also means a lot to him. "It really seemed to fit to take something from a piece that was a big influence," he said. Since Holst was influenced by the astrological "characters" of the planets, that was what Bell focused on when coming up with the recipes for each one. So Venus is light and flavorful to represent an aphrodisiac, Mars a strongly alcoholic double IPA to remind one of war, and Neptune a mystical mix of flavors to represent what was (in Holst's time) considered the edge of the solar system. "Mars was a lot of fun," Bell said. As Bell did the research for his beer line, he discovered that Midnight Sun Brewing Co. in Alaska had its own "planets" series of beers in 2008. He called to make sure there was no conflict, and said he felt comfortable going ahead. "We’re coming at it from different angles, and I think it’s been a few years since they did that," he said. Bell described his 29-year-old brewery as a family-owned business that earns much of its sales through word of mouth. "We're always trying new things," he said. "That's part of the brewing world, coming up with new flavors and new recipes. You know, I think we're fairly innovative in what we do." The brewery joins a growing list of companies and individuals in recent years who have experimented with space alcohol options. Dogfish Head Brewery and Eats restaurant in Delaware launched a "moon dust" ale in 2013 in association with ILC Dover, the contractor that created the spacesuits for NASA's Apollo program. The year before, Brit Ian Hutcheon created a wine with a hint of meteorite inside of it. Some beer is literally space-inspired. Last year, 11-year-old Michal Bodzianowski's microbrewery experiment won a trip to the space station through a student experiments program. An Australian brew has been put through microgravity experiments, while Japanese company Sapporo Holdings Ltd. once spoke of launching a beer from barley grains grown aboard the International Space Station.